Kentucky turned in another one of those outstanding overall game performances in the NCAA first round game against Stony Brook. No serious observer expected Stony Brook to bring the Cats' season to an end, but few expected the Cats to take the Seawolves apart and lead by more than 30 points about midway through the second half (62-32). As a result, the Kentucky Wildcats posted the most impressive first round win of the first day of play, and served notice on the NCAA field that this team is a legitimate contender for the Championship. The NCAA Selection committee once again has undervalued the strength of this UK basketball team with the 4 seed, and as a consequence, the committee placed the Indiana Hoosiers into a collision path with the Cats in the Tournament's Second Round. For the basketball enthusiast, this is a classic March battle but it should have been scheduled to showcase on at least a Sweet 16 stage if not an Elite Eight stage. However, on Saturday evening, one of these two fine basketball teams will end its season prematurely for the quality of its season and team. The Hoosiers and Cats have faced each other four prior times in the NCAA Tournament. Indiana beat Joe B. Hall's first set of Wildcats in 1973, and the Cats have won the other three NCAA matchups against the Hoosiers. First, Joe B. Hall got the grandest form of revenge on his nemesis Bob Knight in 1975, ending Indiana's run at an undefeated season and propelling the Cats to the Final Four. Then Joe B. Hall's 1983 team defeated the Hoosiers in the NCAA. Finally, and most recently, the 2012 Cats avenged their only regular season loss by beating the Hoosiers by 12 in the Sweet 16 on their way to Kentucky's eighth national championship. Saturday will be the fifth IU-UK NCAA meeting, and the stakes could not be higher. As if the drama of a second round encountered between these two college basketball elite programs, each sporting to 15 teams this season is not enough, following the 2012 season, Coach Calipari determined that the traditional home-home regular season series with the Hoosiers was not in the Kentucky program's interest, and discontinued the series. That decision attracted substantial criticism at the time, and now that the NCAA selection Committee has written a script requiring them to play at this time, all of the arguments from 2012 are being reopened. These two teams do not arrive at this intersection by accident. Indiana opened the season with a #13 Pomeroy rating. Over the course of the season, their Pomeroy stock fluctuated between a high point of #12 and a low point of #31. On February 11, prior to their game against Iowa, the Hoosiers were #24, and since that time have won 7 and lost twice, at #3 Michigan State by 19, and to #52 Michigan by 3 in the Big 10 Tournament. 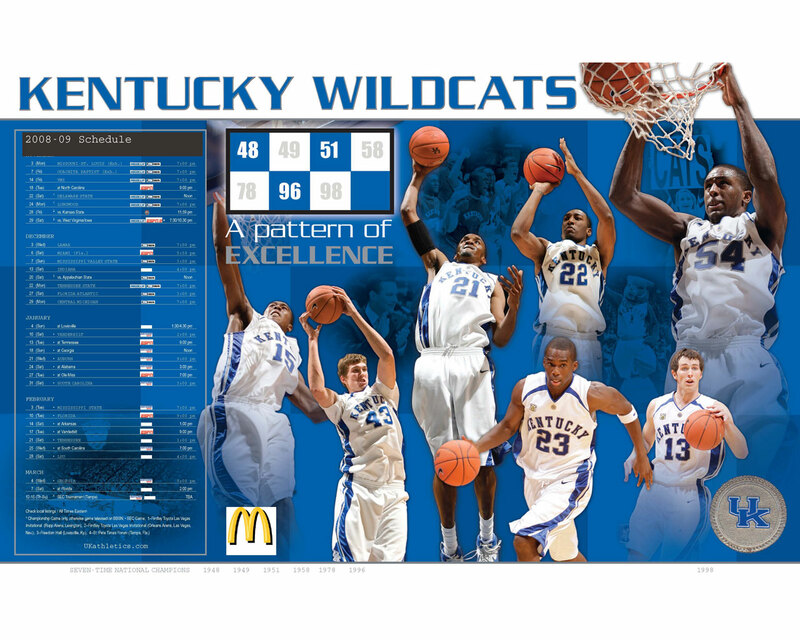 This season pattern is very similar to that of the Cats, who opened the season as Pomeroy's #2 preseason team. The Cats enter this game as the #6 team, and over the course of this season, the Cats' Pomeroy stock fluctuated between a high point of #1 to a low point of #30. On February 6, prior to Kentucky's game against Florida, their Pomeroy ranking was #24, and since that game, the Cats have won 11 and lost twice, at #16 Texas A&M by 2 in OT and at #29 Vanderbilt by 8. The Cats won the SEC Tournament in route to the #4 Seed in the East in the NCAA Tournament. Indiana brings a 26-7 record into this game. IU has played its 33 games at an average tempo of about 69 to 70 possessions per game, scoring 82.8 ppg (1.189 ppp) and allowing an average 69.1 ppg (0.992 ppp). Indiana has turned the ball over on 19.5% of its possessions while forcing turnovers on 18.9% of opponent possessions. On the Boards, Indiana has secured an offensive rebounding rate of 37.6%, and a defensive rebounding rate of 71.3%. 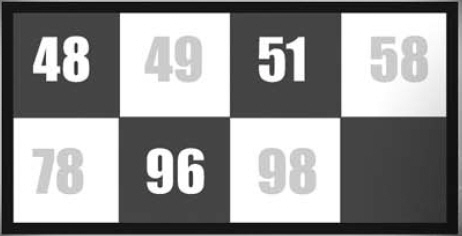 The Indiana schedule has a strength of schedule of 0.6161 (#73). The Cats are 27-8, and over the last 13 games through which this team has reentered the national championship conversation, they are 11-2. Over these last 13 games, the Cats have averaged about 67 to 68 possessions per game, producing 82.7 ppg (1.234 ppp) and allowing 67.4 ppg (0.987 ppp). The Cats have committed turnovers on 13.0% of its possessions and forced turnovers on 15.9% of opponent possessions. On the Boards, the Cats' rebounding rates have been 35.8% and 65.5% on the offensive and defensive ends. The Cats have a strength of schedule of 0.7789. Based on this distribution, the analysis tips in favor of the Cats with a theoretical margin of 9 points, 80-71in a game played at a pace of 68 possessions for the Cats and 69 possessions for Indiana. 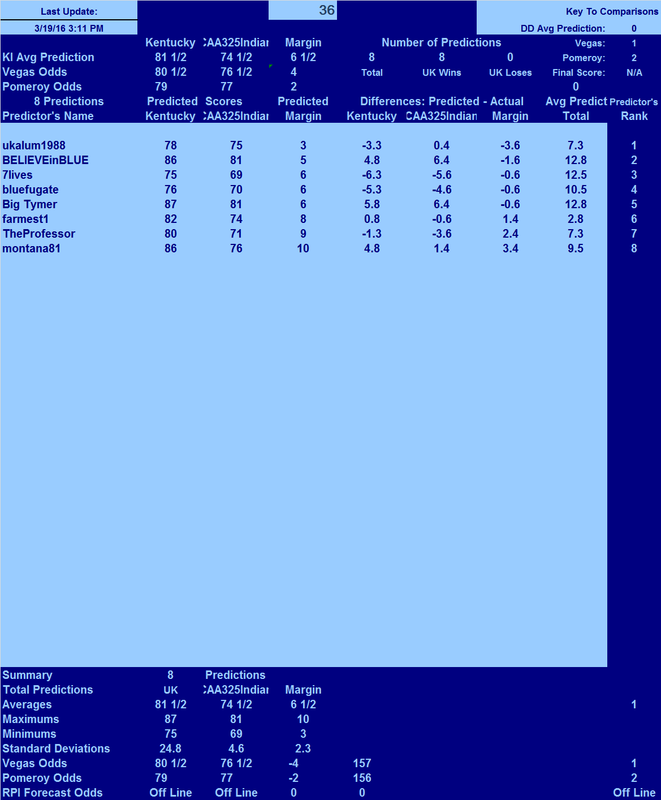 Pomeroy has this as a 2 point Kentucky favorite, 79-77, at a pace of 67 possessions. Vegas opens with UK a 3 point favorite. Skal Labissiere controls the opening tip and the Cats go inside to Alex Poythress who draws a foul. After Alex Poythress makes both free throws, IU answered with a quick basket. The Cats then scored the next 7 points to move on top of the Hoosiers 9-2. The Hoosiers stopped the Kentucky run, got a defensive stop, and will have a pair of free throws after the under 16 media timeout with the Cats leading 9-4. In the second segment, IU makes 1 of 2 free throws, and 3 consecutive UK turnovers allow IU to move into their first lead of the game 10-9. However, the Cats move back on top with 6 straight, and lead by 5, 18-13, at the under 12 media timeout with only 9:54 remaining in the first half. In the first 10 minutes of this game, the Cats have made 7 of 16 shots while IU has made 5 of 15 shots. Tyler Ulis made a 3 pointer, to lift the Kentucky program into another #1 ranking, most consecutive games with a 3 pointer made, passing UNLV. In the short third segment, the Cats maintained their 5 point lead, 22-17 at the under 8 media timeout. For the third consecutive segment, the segment ends with a foul on a UK player. This foul was an offensive foul by Alex Poythress as he made a move to the basket, and is his second foul of the game. In the fourth segment, IU pulled to within 1 point, 23-22, but the Cats got back to back baskets to move back on top by 5. IU answered with a pair of free throws, and a defensive stop at the under 4 media timeout with the Cats up by 3, 27-24, and IU in possession. The Cats trail at the half, 33-32. Kentucky scored 32 points on 36 possessions (0.89 ppp) while INDIANA scored 33 points on 35 possessions (0.94 ppp). The Cats shot poorly in the first half making 11-25 (44.0%) including 1-3 (33.3%) from long range. INDIANA shot the ball poorly, 12-28 overall (42.9%) which included 3-11 (27.3%) from long range. From the line, the Cats were 9-13 (69.2%) while INDIANA was 6-9 (66.7%). The Cats committed 9 turnovers, one for each 4.0 possessions, and the Cats forced INDIANA into 6 turnovers, one for each 5.8 possessions. On the boards, the Cats won the battle 19-14, and the Cats won the battle on the offensive glass 5-4 that resulted in an 0-4 disadvantage in second chance points for the Cats. INDIANA had an efficiency of 0.83 ppp on its 35 first chance possessions and 1.00 ppp on its 4-second chance possessions. 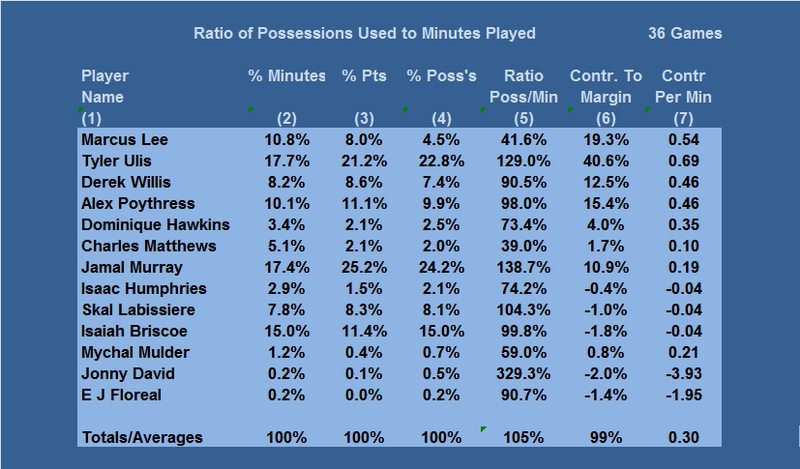 Kentucky had an efficiency of 0.89 ppp on its 36 first chance possessions and 0.00 ppp on its 5-second chance possession. The Cats grabbed 33.3% of its misses and INDIANA grabbed 22.2% of its missed shots in the first half. The Cats opens play in the second half but fail to score. IU gets the first 5 points of the second half, an uncontested layup by Ferrell and a 3 pointer following a UK turnover by Alex Poythress and a missed hook by Skal Labissiere. Coach Calipari takes a timeout, with the Cats down 6, 38-32 and 18:31 remaining in the game. After the timeout, Jamal Murray and Tyler Ulis hit back to back 3 pointers to tie the score at 38-38, and Alex Poythress stole the ball at midcourt and drive for a layup to lift the Cats back on top by 2. IU stopped that UK run with a basket by Ferrell. At the under 16 media timeout, the game is tied at 40-40. In the second segment, the Cats and Hoosiers traded the lead back and forth with the Hoosiers holding a 1 point lead, 45-44 and the Cats in possession at the under 12 media timeout with 11:01 remaining in the game. In the third segment, the pattern of the game continues with the game moving to a 50-50 tie at the under 8 media timeout and IU in possession following Tyler Ulis' third foul of the game. Out of the timeout, the Hoosiers get a 3 point play and following a miss at the UK end, the Hoosier hit a 3 point shot to move on top by 6 points, forcing another UK timeout with 6:53 remaining in the game. After the timeout, IU continued to expand their lead to 10 points, 62-52 before a basket by Isaiah Briscoe trimmed a pair of points off the lead at the under 4 media timeout. Isaiah Briscoe will have one free throw after the timeout to complete a 3 point play if he can make it. Cats lose 73-67 and the 2015-16 season comes to a disappointing end with this loss in the NCAA Tournament's second round with a record of 27-9. UK scored its 67 points on 72 possessions for the game, and INDIANA scored its 73 points on 70 possessions. The Cats controlled the Boards, 34-30, and the Cats won the battle on the offensive glass 10-6. Kentucky used its 10 second chance possessions to score 2 second chance points, and INDIANA used its 6 second chance possessions to score 9 second chance points. 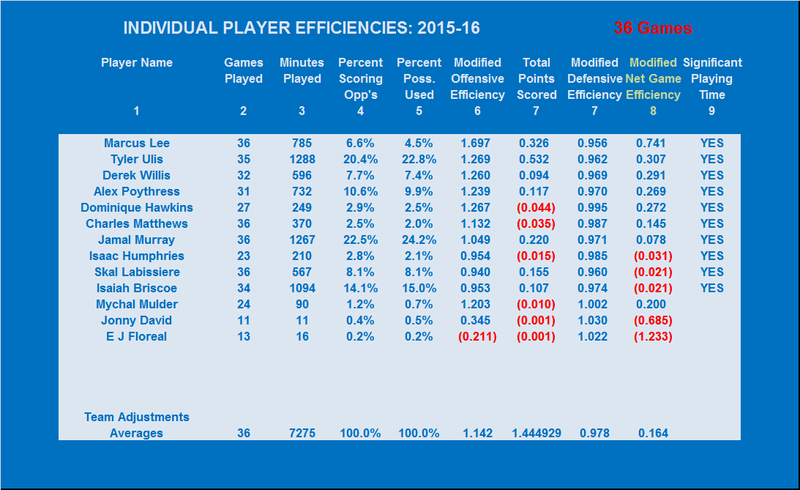 INDIANA had an offensive efficiency of 0.914 ppp on its 70 first chance possessions and 1.500 ppp for its 6 second chance possessions. UK had 0.903 ppp on its 72 first chance possessions and 0.200 ppp on its 10 second chance possessions. With respect to the offensive rebounding, UK grabbed 29.4% of its misses as offensive rebounds while INDIANA was able to convert 20.0% of its misses into bonus possessions with offensive rebounds. UK hit well from the free throw line in this game, making 15-19 [78.9%]. INDIANA made 17-23 [73.9%] for the game. Field goal shooting for UK was 24-57 overall [42.1%] and 4-16 from long range [25.0%]. For INDIANA, their field goal shooting from inside the arc was a 19-31 [61.3%] and from long range, INDIANA hit 6-21 [28.6%]. The Cats committed 16turnovers, one for every 4.5 possessions. The Cats forced 13 INDIANA turnovers, one for every 5.4 possessions. With this loss, the Cats' 2015-16 season ends. The 2016-17 Cats will make its first public appearance at Big Blue Madness in October on a date to be determined.